Relax Melodies is a leader in relaxation and sleep helper with more than 800,000 users worldwide! 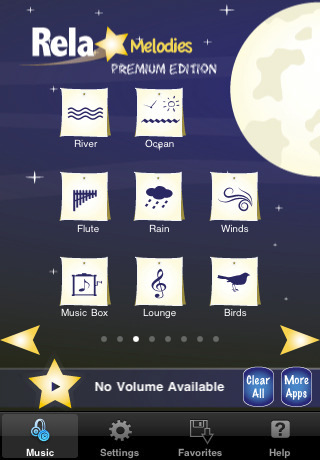 iLBsoft is proud to bring Relax Melodies Premium Edition to your iPhone and iPod touch. Wanna try before you buy? Try our Relax Melodies free app! You will like it and come back to buy the Premium edition! Relax Melodies is a professional grade application that let you make your own relaxation melodies and gives you complete liberty and control on what you want to hear by mixing the sounds together. This is perfect for relaxing, releasing the daily stress or help falling asleep. In a few touch you get your own personal melody and start to relax. The Premium Edition is the ultimate relaxing experience with more options and more latitude that the free version. – Mix any number of sounds together and create new melodies instantaneously! – 52 High Quality Ambient Sounds: Five complete pages of carefully selected sounds to relax and sleep. Combined with binaural beats, it expands the possibility of melodies to a new level. – 6 Binaural Beats: The binaural beats are well known to help the brain reaching a particular relaxation state. They can be combined with any melody for brainwave entrainment to get to the relaxation state you need faster. – Individual volume: An individual volume control is available for each sound. This enable you to go one step further with the sound mixing. – Save and replay your favorite melodies. – Auto-saving and restore your last selection and settings. – Shake for a random selection. On the couch wanting to change to a new selection? Just shake your iPhone or iPod Touch to get a new random melody in a few seconds! – Dynamic background: The sun theme is displayed form 6 am to 6 pm. The rest of the time, the classic night theme is used. – Help screen: A complete help page has been added to get easily all the functionalities of Relax. We have work very hard at iLBSoft to bring you what we think is the best relaxation application! We are always working on improving our app. Try Relax Premium Edition and start to calm down and free your mind now!